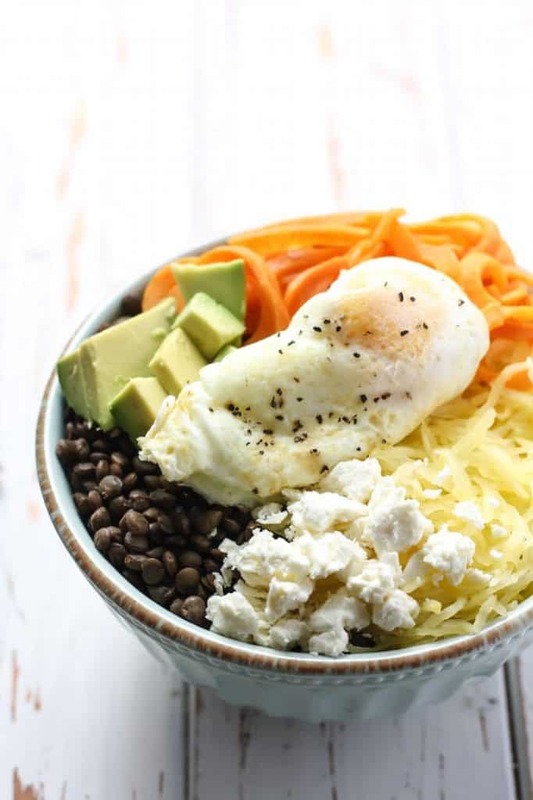 This Lentil Spaghetti Squash Breakfast Bowl is a great way to change up your morning routine. Filled with complex carbs, healthy fats, fiber, and protein to keep you satisfied for hours. Happy Sunday, my peeps! It feels weird to be posting on a Sunday… but I am rolling with it! I was actually very productive today…. That’s kind of a half lie. I accomplished what I wanted to upstairs, i.e. the laundry all over the place and vacuumed. Ummm okay I just forgot I was going to start packing dishes today and I didn’t quite finish that task. And I was also going to put in another load of laundry. Didn’t do that either… And there are still dishes in the sink. OH MY GOSH WHAT DID I DO ALL DAY YESTERDAY? 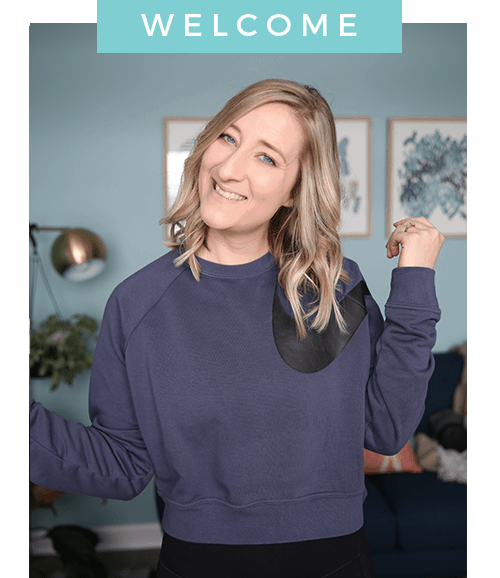 It’s sad I am actually wracking my brain trying to think what I got done… I mean I did get a few recipes done? That counts for something right…? Okay, I HAVE to be better today. And now I am having an internal dialogue with myself about all of the recipes I wanted to make. GAH not enough timmmeeee. Le sigh. Let’s just jump right into this bowl shall we? 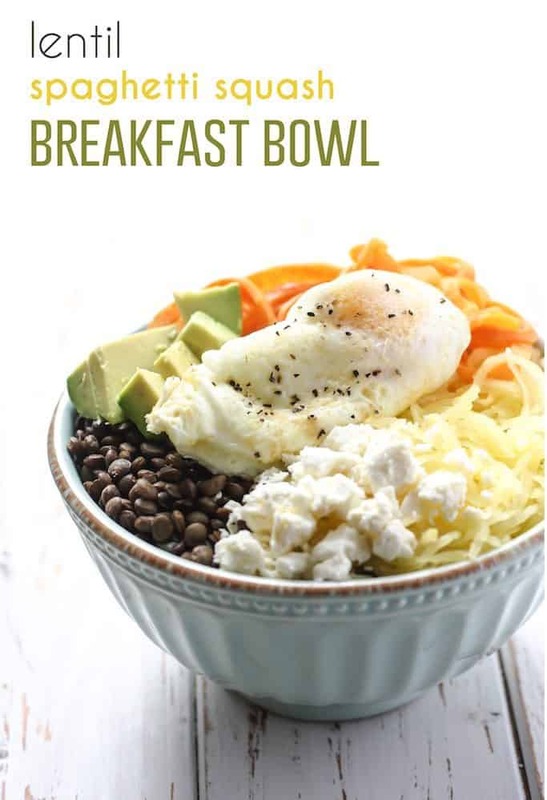 I’m bringing this Lentil Spaghetti Squash Breakfast Bowl to you because I keep saying I am going to start bringing you real meals and not just treats (healthy or not) and gosh darnit ( < that word is coming up red… How the eff do you spell that?! If I wasn’t trying to sensor myself we wouldn’t be having this problem… moving on.) I must keep my word. I’ve noted in the recipe about roasting your spaghetti squash beforehand. And if you’d like you can also do your lentils and sweet potato then too! Personally, I spiralized my sweet potato using Ali’s Inspiralizer* and cooked them in a bit of olive oil before the eggs. But I was also making this on the weekend so I had the extra time. 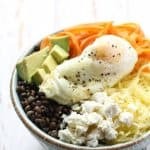 If you’re looking to have this for a quick breakfast during the week, I’d suggest cooking them the night before with the spaghetti squash and lentils. Then all you’d have to cook in the am is the eggs and slice up some fresh avocado! 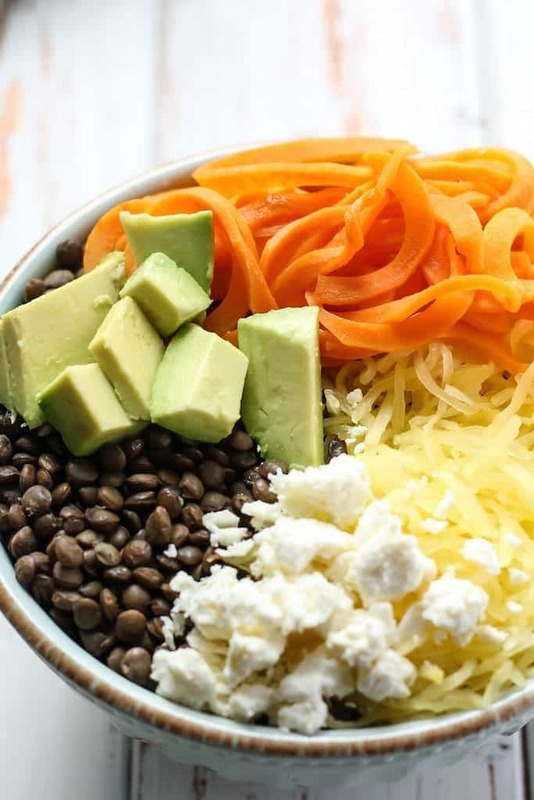 Like I said above, this bowl basically combines all of my favorite foods (avo, eggs, feta) plus the addition of hearty lentils, spaghetti squash and sweet potatoes. This breakfast is pretty killer on the nutrition front if you ask me! The way I divided up the bowls you get about 300 calories, 25 grams of carbs, 16 grams of fat, 20 grams of protein and 9 grams of fiber. Super satisfying if you’re looking for a meal to help get you through til lunch time. Cook the lentils: Rinse lentils in fine mesh strainer. Place in small pot with 1 1/3 cups of water and bring to a boil. Reduce heat to low and simmer for about 15-20 minutes, or until tender. Remove from heat and drain excess water if necessary. Add as many lentils and as much spaghetti squash to your bowl as desired. For reference I used about 1/2 cup cooked lentils, 2/3 cup spaghetti squash, and half of the medium sweet potato for one bowl. Top with cooked egg, 1/2 avocado and 2 TBS feta. Store the leftovers in fridge if necessary. *MEAL PREP TIP: You can make lentils, sweet potato, and spaghetti squash the night or couple days before. To roast spaghetti squash, cut lengthwise and rub inside with a bit of olive oil. Place face down in a shallow pan with about 1″ of water and roast at 375F for about 30-40 minutes, or until tender. You don’t have to use water to steam, but I’ve found it cooks quicker this way. -Nutrition based on directions on my suggestions. Adjust to your dietary needs. 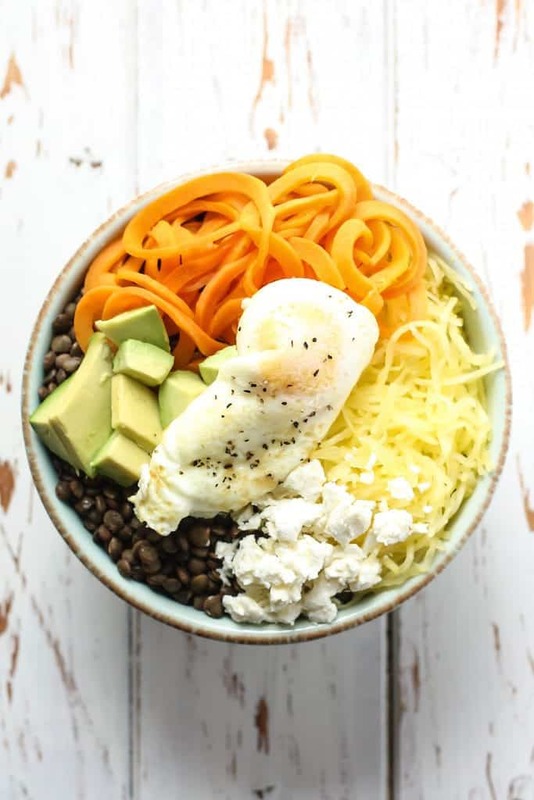 Doing breakfast right > Lentil Spaghetti Squash Breakfast Bowl. Complex carbs, healthy fats, fiber, protein. The gang’s all here. I can’t even begin to think what my favorite food from the bowl would be. I mean, I just love EVERYTHING in that bowl. So perfect! I make lentils with eggs all the time. So good! I’ll have to try it with spaghetti squash. So creative! love this combo and this lighting is to dieee for ! ooo i love that you made this bowl Ashley! Its like, all random ingredients, but they somehow all work perfectly? Especially the feta and lentils, YES please. This would definitely be a weekend breakfast though for me, i dont think i can eat all that before work! Wowza!! This sounds like the ultimate combo in nutrition and color! I would def eat this for every meal, maybe twice in one day ? NO SHAME ??? I like this bowl!!! It looks so delicious! And girl, I hear ya! There are many days I ask myself “what the h.e. double hockey sticks did I do today?’ I always miss-judge how long recipes actually take. I wanted to get three done today and managed to get one done. Ah well…it’s all good! Have a great week! I feel like I could eat this for breakfast lunch AND dinner! Yummmmmmmmm! Such a full bowl of healthy GOODNESS! 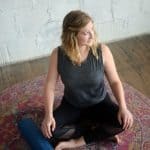 I’m turrible at meal prep…I did it three times and said “I’m done”! And now my eating isn’t as good, to no one’s surprise, tehehe. 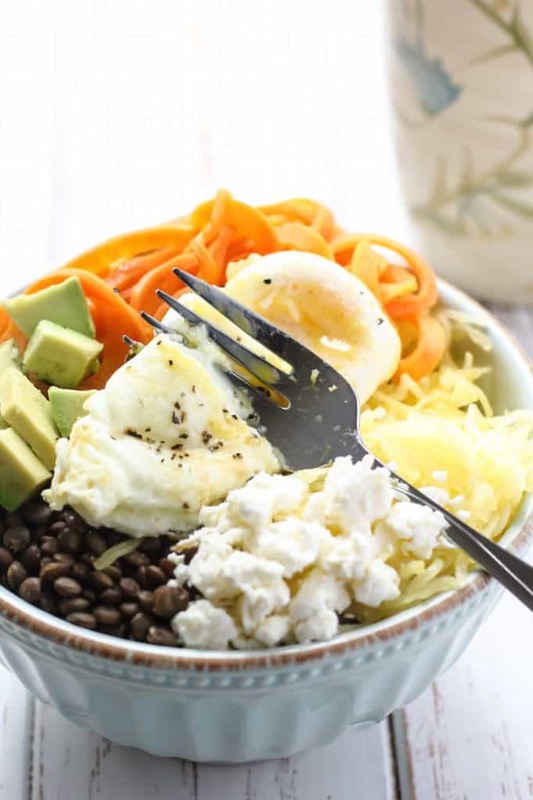 I am literally obsessed with breakfast bowls and spiralized everything but I haven’t made a savory version yet, whoops! I blame that on TJ’s not having spaghetti squash for the past two months! This looks delish! Never enough damn time! I get it. My house is a disaster 90% of the time so don’t feel bad. I typically do sweet potatoes, eggs, and sautéed kale for breakfast every morning, but even with that carb loaded potato, sometimes I’m not satisfied. THIS would do the trick FO SHO! lol lentils are great on anything! And also eggs for that matter… well pretty much anyways. This is a perfect breakfast!! Sooooo satisfying, super healthy. It’s a feel good morning! !